U.S. President Donald Trump Friday called every child "a precious gift from God" and said his administration will defend the right to life as he addressed pro-life activists gathered for the 45th annual March for Life. The remarks from the White House Rose Garden were broadcast by satellite onto a huge TV screen before hundreds of thousands of pro-life supporters taking part in the march in Washington. Surrounded by a group of participants from the rally, Trump said his administration "will always defend the very first right in the Declaration of Independence, and that is the right to life." Earlier, Trump proclaimed January 19 as "National Sanctity of Life Day." The White House released a statement Friday saying the Department of Health and Human Services is proposing to restrict taxpayer funds from being used by groups with "discriminatory" policies or practices, protect Americans who have religious or moral convictions "related to certain health care services," and recognize that Americans should not be discriminated against for their religious or moral beliefs when participating in such health care services. The release did not specify what was meant by "discriminatory policies" or "certain health care services." Trump is the first sitting president to speak to the March for Life rally via live video address. The rallies first began in response to passage of Roe versus Wade, the 1973 Supreme Court ruling that confirmed the legality of a woman's right to have an abortion. Previous presidents have addressed the march by recorded message or via phone call — Ronald Reagan in 1987 and George W. Bush in 2003 and 2004. Trump criticized Roe versus Wade, saying it has resulted in some of the most permissive abortion laws in the world, including late-term abortions. He encouraged the Senate to pass a bill already approved in the House of Representatives that would end abortions after 20 weeks of pregnancy. Through political means and rallies, both pro-life and pro-choice supporters have been making their voices heard ever since the Supreme Court decision. "We are trying to protect babies in any way we can through legislation now," said Carol Tobias, president of the National Right to Life Committee, the country's largest pro-life organization. During an interview with VOA in advance of the march, she said her group wants Roe versus Wade reversed, but is also trying to stop abortion through state laws. We want to see abortion stopped in every state, said Tobias. So if you have a state legislature and a governor who is working with our Right to Life state affiliates to pass laws that protect babies and moms, "I think that's great," she added. Eleanor Smeal, head of the Feminist Majority Foundation, said women should have the right to decide if they want an abortion and Roe versus Wade makes that point. "We're for legal and safe abortion," she said. "When you force women against their will to have children during times that are very difficult for them, you are actually having a negative impact on their health and well-being and on their families." Tobias is encouraged by Republican-led administration efforts that are going forward to abolish abortion. On Thursday, the Trump administration announced it is creating an office to protect the rights of medical providers, including those who oppose abortion. Last year, President Trump implemented the Global Gag Rule that prevents U.S. funding from going to any overseas organizations that promote or perform abortions. Tobias said she is hopeful pro-life legislation put forward in the House of Representatives may eventually be approved by the Senate. "We are very happy that they've already passed the No Taxpayer Funding for Abortion Act," she said. But Smeal said those efforts are out of step with the public opinion of most Americans on abortion. "All they're doing is making it tougher on people," she said. "Whether it's legal or illegal, abortions are going to occur." 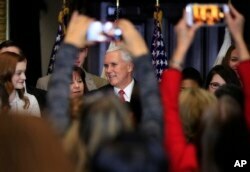 Vice President Mike Pence with his wife Karen Pence speaks to anti-abortion supporters and participants of the annual March for Life event, during a reception at the White House in Washington, Jan. 18, 2018. While introducing President Trump, Vice President, Mike Pence, long a pro-life supporter, called Trump the most pro-life president in American history. But that wasn't always the case. Years ago, President Trump said he was pro-choice, but during his presidential campaign, he expressed the opinion that there has to be "some form of punishment" for people who have abortions. Both Tobias and Smeal agree that is a bad idea. "The pro-life movement has never sought penalties for women who get an abortion.We want to stop the abortionist," said Tobias. Trump later backpedaled from his controversial position after a wave of criticism, saying doctors who perform abortions should be punished if the procedure is outlawed.